Mayors, Companies Vow To Act On Climate, Even As U.S. Leaves Paris Accord : The Two-Way President Trump has announced he will withdraw the U.S. from the global agreement to fight climate change. But more than 1,200 mayors, governors and business leaders say they're still on board. 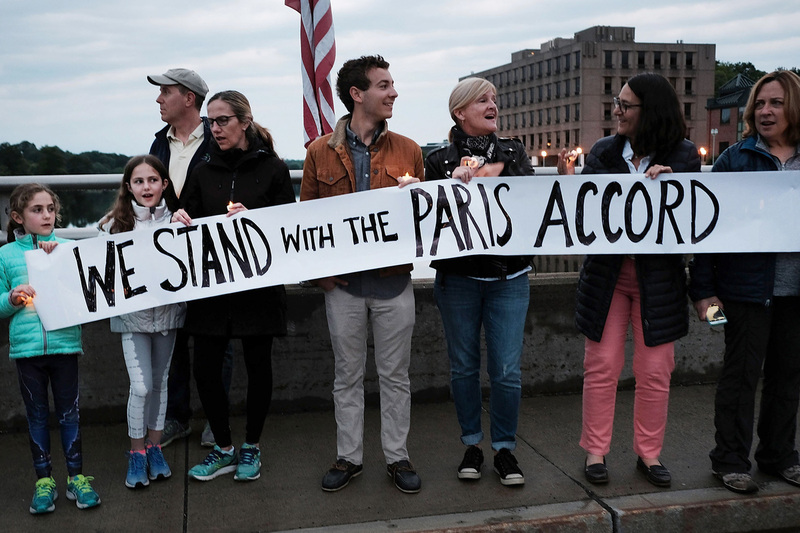 Connecticut residents at a rally for the environment against President Donald Trump's decision to withdraw the U.S. from the Paris climate accord. Connecticut is one of twelve states and Puerto Rico that formed the U.S. Climate Alliance, all committing to uphold the Paris Accord. Days after President Trump announced that he would be pulling the U.S. out of a global agreement to fight climate change, more than 1,200 business leaders, mayors, governors and college presidents have signaled their personal commitment to the goal of reducing emissions. In an open letter, the signatories vow to "continue to support climate action to meet the Paris Agreement," even "in the absence of leadership from Washington." Since Trump's announcement, many mayors and governors have been stepping forth to declare their continued commitment to fighting climate change. Twelve states and Puerto Rico have formed the U.S. Climate Alliance, all committing to uphold the Paris Accord. Leaders of 211 cities have declared themselves "Climate Mayors" and promised to work toward the Paris targets. The new open letter features many of those mayors and governors, as well as more than 170 college and university presidents and hundreds of businesses, investment groups and other organizations. The corporations include tech giants, like Google, Apple, Facebook and Microsoft, as well as businesses from a wide range of industries — including Target, Timberland, Campbell Soup, Burton Snowboards, breweries and health companies. "In the U.S., it is local and state governments, along with businesses, that are primarily responsible for the dramatic decrease in greenhouse gas emissions in recent years," the letter reads. "Actions by each group will multiply and accelerate in the years ahead, no matter what policies Washington may adopt." The letter is called "We Are Still In" — as in, still in the Paris Accord. Only two nations, Nicaragua and Syria, have never signed on to the global agreement to fight climate change, and the U.S. is the only country to declare it will leave the pact. The departure couldn't officially go into effect until November 2020, but Trump said he would cease implementation efforts immediately. So What Exactly Is In The Paris Climate Accord? The Paris Accord defines shared goals: most significantly, a global goal of allowing the world to warm by less than 2 degrees Celsius (about 3.6 degrees Fahrenheit). Each country also sets voluntary targets for reducing its carbon emissions. But the agreement leaves it up to each nation how exactly to meet that goal. So abiding by the Paris Accord isn't a matter of following specific rules or regulations — just about contributing, in one way or another, to substantial reductions in greenhouse gas emissions. The signatories to "We Are Still In" say they are "delivering concrete emissions reductions that will help meet America's emissions pledge under the Paris Agreement." The letter was coordinated by a group of organizations including "The B Team," co-founded by Virgin's Richard Branson, and Michael Bloomberg's Bloomberg Philanthropies, which has already promised $15 million to fund climate change efforts at the U.N.